Win a $50 Gift Certificate to AccuVision! Congratulations to Robert Vancamp on winning our twenty sixth High Five Giveaway and thank you to all who entered! 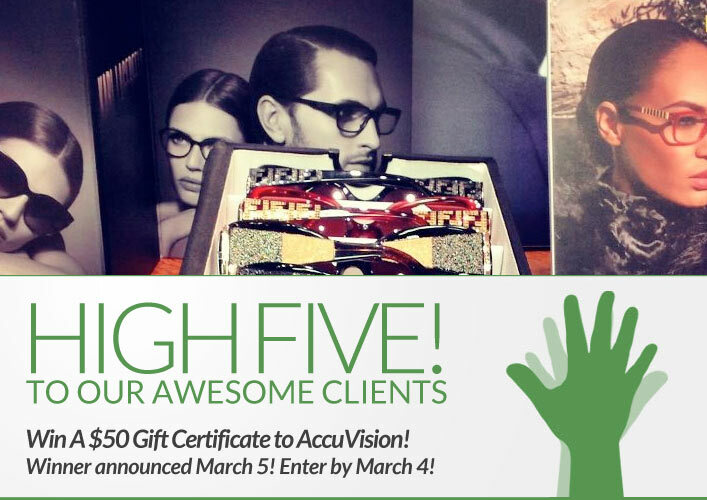 Our next High Five Giveaway is for a $50 gift certificate to AccuVision. Using state-of-the-art instrumentation Dr. Doherty and his associates provide comprehensive eye health and contact lens exams up to seven days a week (please call for current hours). Their one hour in-office labs give you fast service without a sacrifice in quality. The Michigan Avenue and Gurnee Mills Mall offices can do bifocals in less than 2 hours in most cases. They have almost every type of trial contact lens in stock. This will allow you to leave their office with the proper fitting lens after your eye exam. They take pride in being able to help you choose affordable designer frames and “Priced Right” eyewear that will best complement your facial features. They are able to execute that goal due to their commitment of showcasing the largest collection of fashion forward eyewear in the Chicagoland area. AccuVision is located at 321 N. Michigan Ave. Visit their website at www.accuvision.com or call them at 312-641-2020 for more information. What percentage off hair and make up services do you receive when you refer a friend to XEX? Now, just add a comment to this post with the right answer to be eligible to win! The winner will be announced on Tuesday, March 5. Entries must be received by midnight on Monday, March 4. Good luck! 30% off hair and make-up. You will receive 30% off hair and make up services.